We offer the Sedge Chesapeake Retriever coat color as our standard coat color, but you may have your Chesapeake Retriever gifts customized with your dog's colors by utilizing the "custom coat color/pattern" option on the item page (a small art fee will be applied for all custom work). 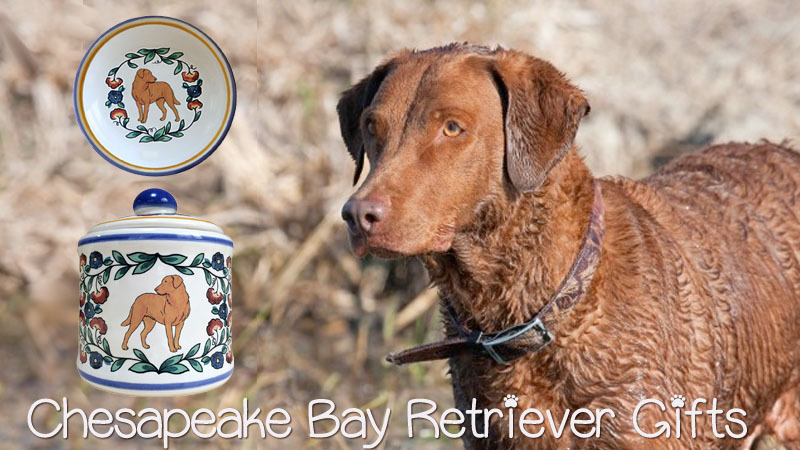 There are many Chesapeake Bay Retriever items to choose from, including Chesapeake Bay Retriever mugs, wine stoppers, sugar bowls, creamers, dipping bowls, treat jars. We add new items to our offerings from time to time, so the list is always growing. Our stoneware is durable, therefore, you can use it daily without worry. And it is intended to be easy to care for, so feel free to use your Chesapeake Retriever pottery in the microwave, oven, and dishwasher. Chesapeake Bay Retrievers are the third most popular Retriever in the US, according to the AKC. However, most of the Cheseapeake Retrievers in the US are owned by waterfowl hunters. This breed has a reputation for being a strong, tireless retriever in the field. It is relentless at doing its job, and that deserves a lot of respect. We had a very good friend, when we lived in Vermont, who owned Chesapeake Bay Retrievers. There was something so mesmerizing about their toughness and intensity which conflicted with the feelings of warmth that their caramel wavy coat and beautiful eyes inspired. We are very happy to celebrate this strong working dog with our unique Chesapeake Bay Retriever Gifts.